Encaustic printmaking is spontaneous and experimental. Students need no printmaking experience to create beautiful and interesting prints. The process is simple, requiring no press. A design is drawn on a warm surface using encaustic paint sticks or small pieces of encaustic paint. The wax melts quickly. A piece of paper is laid down on the surface of the melted wax, rubbed gently on the back and lifted, creating an encaustic print or monotype. The monotype can be left as it is or more encaustic can be added to the warm surface and the new print can be laid down again, creating further interesting textural effects and interplay of the colors. 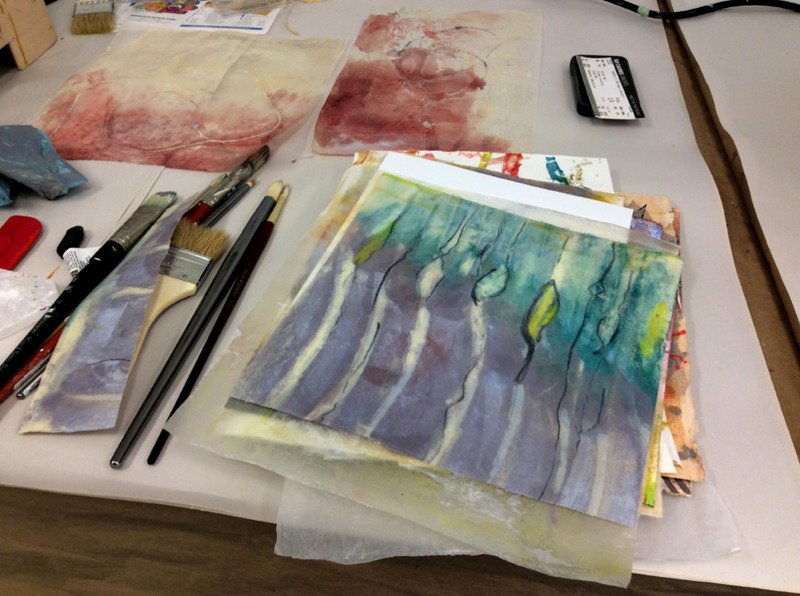 Plain rice paper works well for encaustic printmaking, but other papers such as drawing and watercolor papers do too. Old artwork such collages, pencil and ink drawings and small paintings on paper can be printed over, creating an entirely new work of art.